Fascinating Features, Award-Winning Design, All the Latest News - and all at Historic Savings! Love American history? Proud to be a member of Today’s DAR? Committed to maximizing the value of your membership? Then you likely already subscribe to our National Society’s publications, American Spirit and the Daughters newsletter. But guess what? There’s never been a better time to sign up or renew, thanks to a limited-time, special offer to celebrate the upcoming milestone 125th Continental Congress. 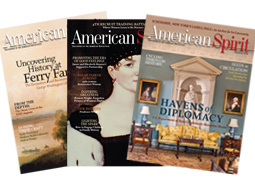 Subscribe, renew or give a three-year subscription now at http://www.dar.org/AmericanSpiritSale and you’ll pay just $45 — that’s a savings of more than $26, or 33 percent, off the cover price — so you essentially enjoy the third year for free! But hurry: this great offer expires on June 1! I have had the privilege of serving as the volunteer editor-in-chief of our Society’s magazines since 2004, and I’m delighted to share that our circulation is at an all-time high since the launch of American Spirit. Why? Because issue after issue, we offer our readers fascinating stories, beautiful design and a riveting connection to the Society and its important work. If you have been a member for 15 years or longer, you likely remember the prior incarnation of our DAR Magazine – though full of DAR business, it frankly wasn’t particularly appealing. Under the leadership of then-President General Linda Tinker Watkins, the National Society divided its magazine into two separate publications: the Daughters newsletter, focused on the business of our Society, and American Spirit – a beautifully illustrated companion that celebrates not only our ideals but also the seminal time of American history that unites us: the Colonial through the Federal periods. Members receive both titles; non-members receive only American Spirit. Like our DAR Museum and Library, our world-class magazine perpetuates the memory and the spirit of the men and women who achieved American independence. American Spirit is designed, like our museum and library, for the general public in order to commemorate the establishment of our nation and the ideals on which our Society was founded. With features that range from genealogy to heritage travel, from women’s history to Revolutionary War content, from historic homes to book reviews, each issue is a premium publication that we believe is worthy of proud display on your coffee table. And as a result, American Spirit has been nationally recognized with prestigious awards, year after year. We have a great behind-the-scenes team that produces each edition – from three locations. Liz Partridge coordinates DAR content at our National Headquarters in Washington, D.C., and our publishing partner is Hammock Publishing of Nashville, Tenn. Planning for each bimonthly edition begins six to eight months in advance, and through the wonders of the Internet, I am able to review, edit and approve manuscripts and layouts in New York. The final team decision involves choosing each cover – always difficult to do, given the wide range of beautiful features that are included in every edition. I will admit that our Magazine Team is quite proud that our circulation has climbed to nearly 50,000 – we have had a nearly 65-percent increase in circulation in the last decade due to our commitment to produce compelling, beautifully illustrated content. We are also quite proud that at this circulation, we fund all of the current production expenses of the magazines. For more than a century, the magazine has been the chronicle of our National Society. Our hopes, our plans, our national heritage and our achievements have been inscribed on its pages. Please don’t miss your opportunity to support our Society’s magazines during this limited-time anniversary special offer. I promise that your only regret will be that you did not do so sooner!